His Building Blocks: Back to School! 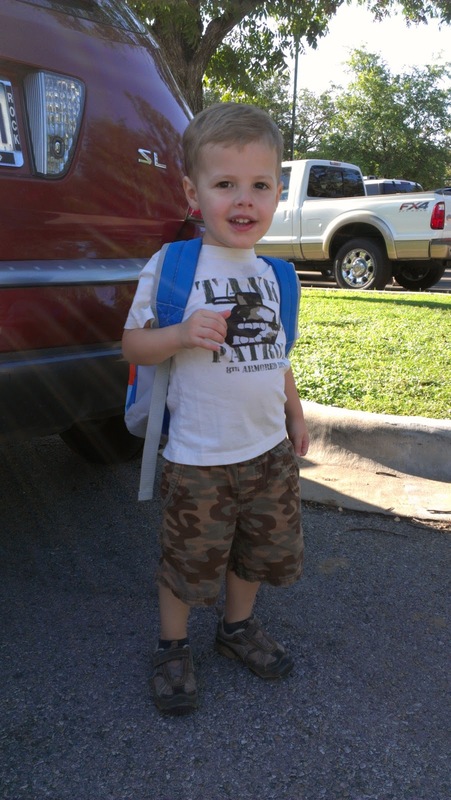 Last week was Luke's first day back to school....and it happened to be at a new school. We all absolutely LOVE his new school, which is also just 4 miles from our house! We met Luke's teacher, Ms. Krista, at meet the teacher night on August 30 and just knew it was going to be a great year. She is awesome! She has such a sweet demeanor and has some great experience. She must really love two-year olds, because her and her husband also teach the two-year old Sunday school class at the church every week. She included in our packet some biographical information about herself, in addition to her testimony. 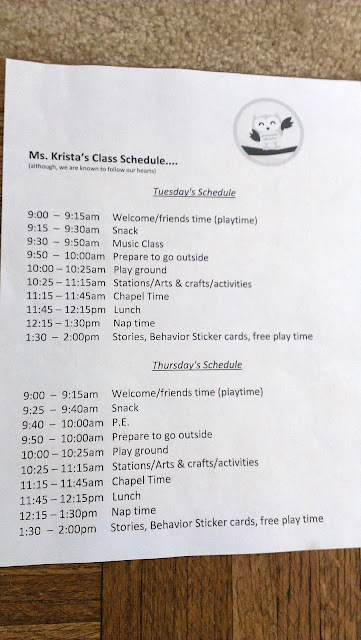 She is very organized as well, and gives me information about how Luke did in school each day. She has already told me that she thinks Luke is such a sweet little boy (which I agree with, but it is nice to hear from someone else as I know I am biased). She seems to already understand that he thrives on environments where he can get lots of hugs. Anyone who knows Luke gets that "Physical Touch" is one of his Love Languages. 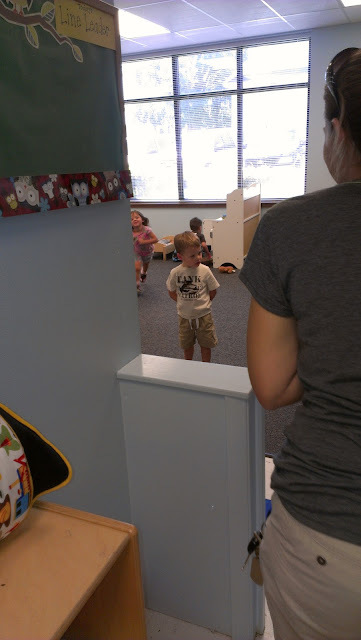 Luke on his first day of school. 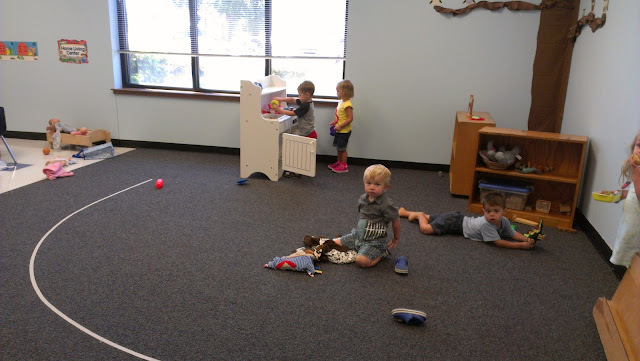 Luke attends from 9am-2pm on Tuesdays and Thursdays. Because of his age, he is required to have a nap or rest time from 12:15-1:30pm. This was my biggest concern since he absolutely loves his two-hour naps each day (normally from about 1-3pm or so at our house). But, he is adapting pretty well already. Luke was waiting patiently for me to pick him up on Tuesday. I was surprised when he wasn't extremely eager to leave. 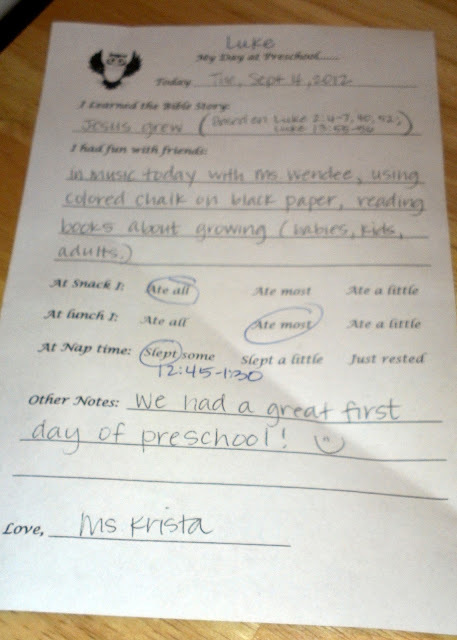 We receive a written report each day about how Luke did at school, what he learned, how much food he ate, etc. I love this! The tape on the floor is for circle time. Luke told me about it on the way home from school the first day. 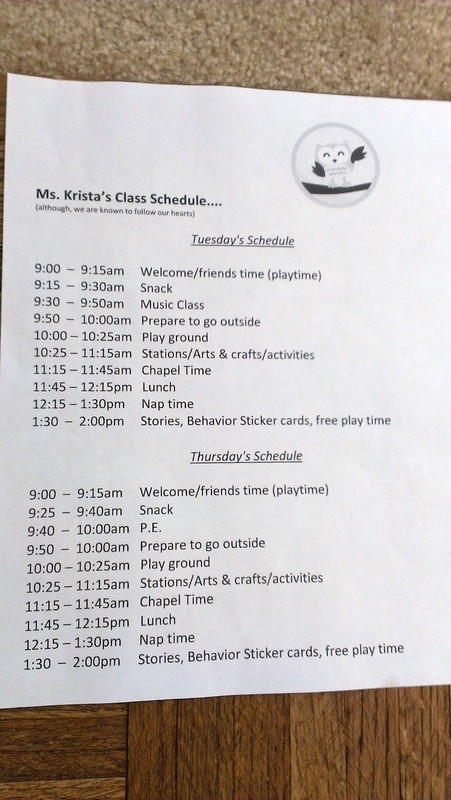 Here is his class schedule. He was pretty excited about his P.E. class on Thursday. I love that he has been telling me about Chapel Time each day. I asked him about his prayer requests this past week. (The kids pass around a rock and state their prayer request as they are holding the rock). On Tuesday, he prayed for mommy and daddy. On Thursday, he said he prayed for God---then corrected himself and said, "No..no..no..I prayed for mommy and daddy again." 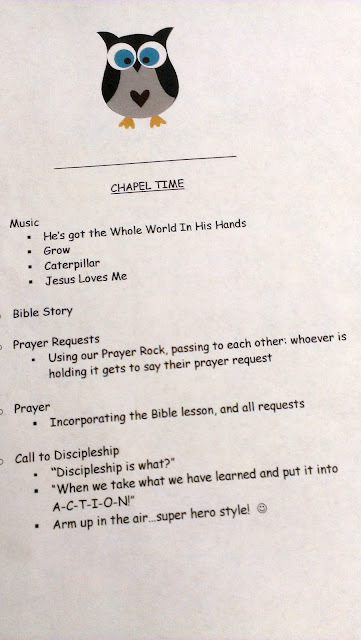 I wish I were a fly on the wall during prayer request time for a two-year old class. That has to be so precious! One of our least favorite things about this particular class is that it is peanut free. There are a couple of kids in his class with peanut allergies. Unfortunately, our Tuesday/Thursday lunch typically included a peanut butter and jelly sandwich, simply out of convenience. Don't get me wrong--I completely understand the reasoning behind not allowing peanut butter in the class. I would be very protective of my child as well if he/she had an allergy like that. It just makes things a little more difficult. Apparently, this is the only class at school (and Ms. Krista's first class) that is peanut free. So, I visited Whole Foods and purchased some soy nut butter to replace the peanut butter. We tried it on Thursday. Luke ate every single bite of his meal that day! We love our good eater! 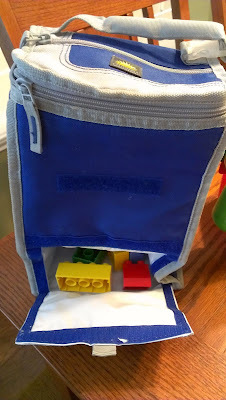 I guess Luke was pretending with his lunch bag the previous day and placed some Legos in that lower compartment. Because he was used to always having a sandwich down there he was probably not amused by the blocks being there. Also, his teachers probably thought I was having a rough morning when I packed his lunch! Ha! 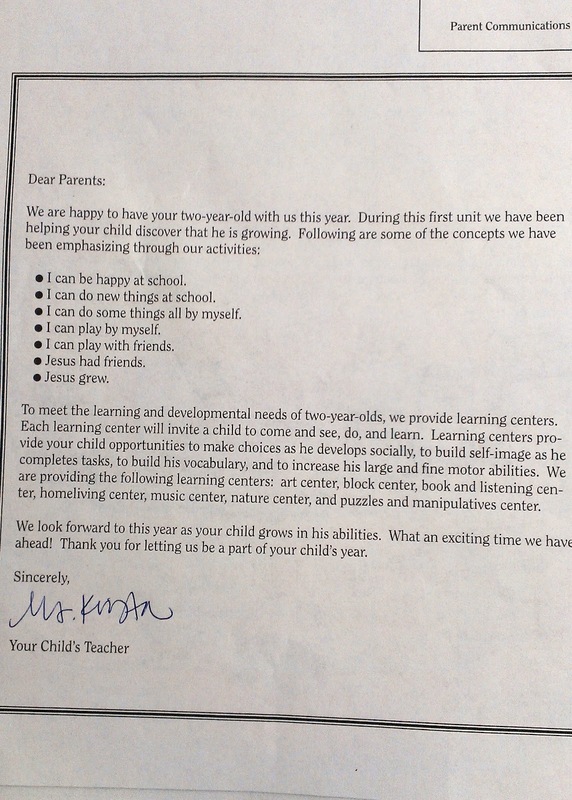 It appears like we will get some great communication along the way for each learning unit. This will also help me reinforce what he is learning while we are home. 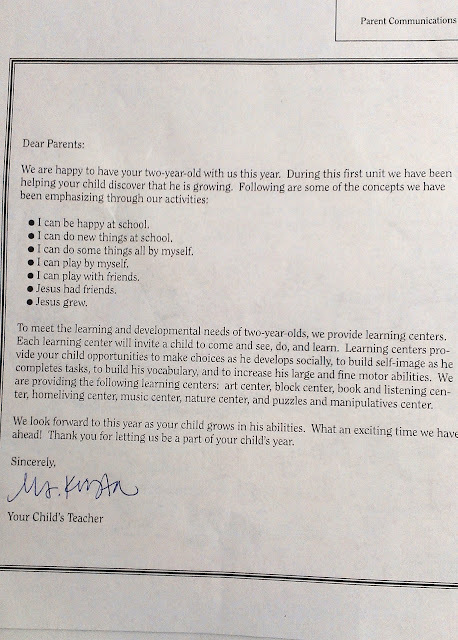 In a nutshell--we love his new school and teacher and are looking forward to a great year!